Awin look at some of the methods that will enable you to engage directly with your audience and increase your affiliate performance as a travel advertiser. Digital research firm, eMarketer estimates worldwide digital travel sales - including air tickets, car rentals, hotel bookings and transportation - will rise from £443.39 billion in 2017 to £618.57 billion by 2021, as higher living standards and technological improvements have made travel experiences accessible to more people across the globe than seen previously. Air travel is also much more efficient today, making distances between countries seem shorter than ever. Meanwhile, the expansion of global trade also means that the number of business travellers will keep on increasing. 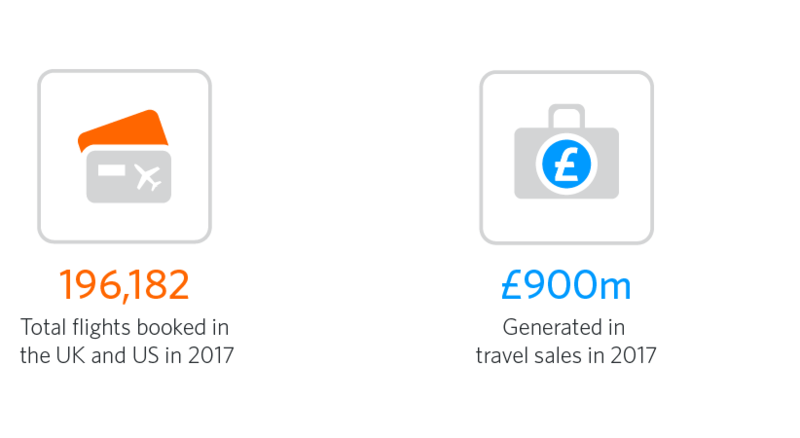 This growth rate is a great incentive for travel publishers to join an affiliate network and start monetising their website traffic. Having a substantial flow of traffic to your website is not a prerequisite to create a profitable business however, in fact small projects can do very well from affiliate marketing. Websites such as podroznik, which share regular special offers or bestchildfriendlyholidays which target niche groups of travellers with content heavy projects are great examples. Why should I use affiliate marketing for my travel website? Becoming a travel publisher allows you to place affiliate links on your website whilst sharing your experiences and is a great way to monetise your online traffic. You can also work with travel brands who may wish to sponsor your future adventures in exchange for a sponsored blog post or exposure on social media. Identifying the right brands for you and your audience can be time consuming, so using an affiliate network that operates internationally can offer you access to a large pool of advertisers. The use of an affiliate network also helps find new services and products for your audience, so you can create profitable partnerships without damaging your websites’ credibility. With access to more than 800 travel clients on the global Awin network, it is easy to find the right brands for your audience. You can search for travel brands using our Advertiser Directory and via the ‘Advertisers’ tab in the User Interface (UI) by clicking Advertisers’ > ‘Join Programmes’ and search from a list of advertisers you are currently ‘Not Joined’ to. To find the most relevant brands for your website, you can customise and filter your search results by advertiser ’region’ and ‘sector’, simply tick travel as your sector when filtering. The results list also includes important information such as conversion rate and average payment time that will help you identify your preferred partnerships. Tip: You can increase the ‘Results per Page’, using the drop-down tool on the top right of the page. The use of visuals can be the most engaging content on a travel website, however, the chances of someone clicking on a Christmas-themed banner in the middle of August are low, so make sure you are using the most current creative for all of the brands you are promoting. To check this, head to ‘My Creative’ within the ‘Links and Tools’ section of your Awin account to see what new creative has been added and what may have expired. This is especially important for any short-term or seasonal promotions and the same goes for any copy that a brand has provided. The creative directory includes all active creative from programmes you are already joined to, and if there are specific programmes you are interested in but not joined to, request to join and once accepted you will have full access to their creative. When choosing the right creative for your website and audience, you have the option to filter by advertiser, creative type or creative dimensions in order to get access to a specific creative you are looking for. If you cannot find the size or type you wish, don’t hesitate to get in touch with the dedicated Awin Account Manager for that advertiser. You can find these contact details on the advertiser’s profile. 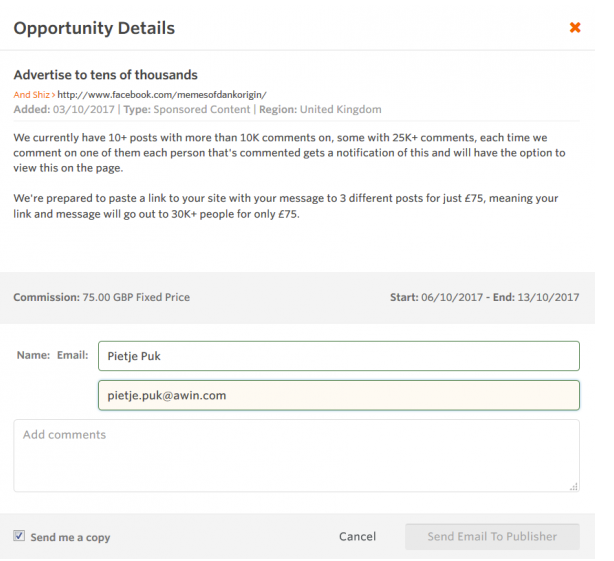 Our Opportunity Marketplace tool is an efficient way for publishers to post and promote available placements to advertisers via the Awin User Interface. It works as a directory and allows publishers to control information about placements and specify creative requirements. Find out more about the benefits here. At the same time, many travel brands use Opportunity Marketplace to promote and sell their distressed inventory. This term is used to refer to rooms, seats or packages that are not expected to be sold at full price. This can be due to many reasons, but the most common is cancellations in close proximity to the booking date. For these tickets or bookings, brands often significantly reduce prices to encourage consumers to book and try to work with publishers who can promote the specific destination. Therefore, do not be afraid to go granular when posting a new opportunity on the Marketplace. For example, if you are planning to visit Mexico or just came back from a holiday there, you can monetise your blog posts by creating a Mexico themed editorial opportunity. To create your opportunity, navigate to Opportunity Marketplace and click on the ‘Add New Opportunity’ option. A new window will open, where you can add a title, description and price for your opportunity, including availability for different dates. You should make the opportunity as informative as possible and include the key benefits of the partnership, including details of the placement and audience reach where applicable. A detailed view of an opportunity in the marketplace. Communicating regularly with contacts you have in the affiliate industry will help you form stronger relationships and gain further insight on how to improve your content and performance. The ultimate goal of a successful travel affiliate should be to create strong, original and relevant content for readers, focusing on niche areas of travel for example creates a valuable user experience. Focusing on specific markets and cities or other aspects, such as a nature, activities, nightlife or demographic characteristics targets smaller audiences and their specific needs and although these pieces may drive a smaller number of site visits, your conversion rate will increase as the content is relevant and unique. For a sector that is ever changing, it is vital to keep up with new and emerging trends as well as travel updates within the affiliate industry, such as programme launches, travel events or changes in regulation. 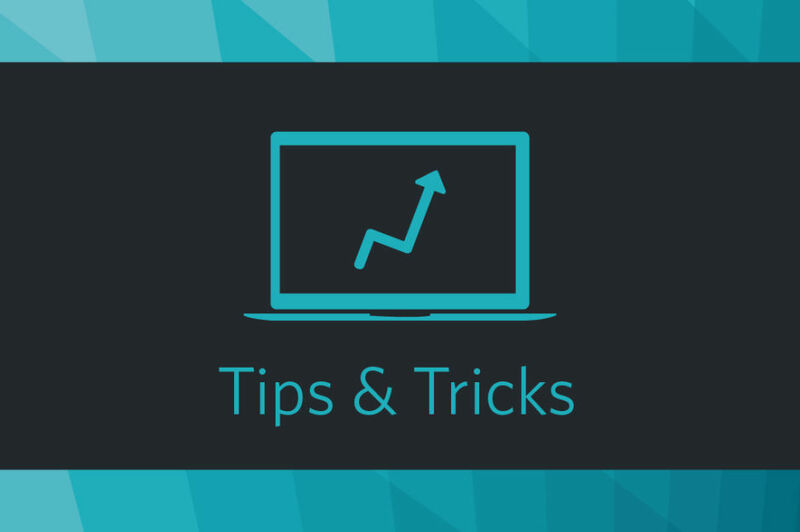 The Tips & Tricks and Back to Basics section on our website can be a great starting point, plus you can also sign up to our Travel specific roundup which includes top travel offers, latest sector news and helpful tips on how to improve your affiliate performance. If you would like to discover more tips and tools to help you optimise your strategy as a travel affiliate, then do get in touch with our Publisher Services Team.